76ers point guard salutes teenagers who egged politicians for blaming New Zealand terrorist attacks on Muslim immigration. NBA All-Star and Philadelphia 76ers point guard Ben Simmons paid homage to the teenager involved in an egg attack against a politician for saying Muslim immigration was to blame for the terrorist attacks in New Zealand. Australian Senator Fraser Anning said "the real cause of bloodshed on New Zealand streets today is the immigration program which allowed Muslim fanatics to migrate to New Zealand in the first place." 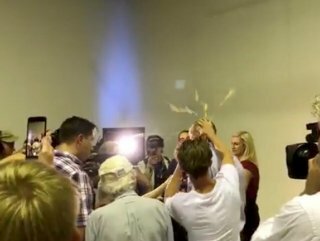 Will Connolly, now commonly known as "egg boy", responded to the senator's comments by smashing an egg on his head. The senator retaliated by slapping the 17-year-old in the face and is now facing calls to be suspended from Parliament. The terrorist attack on two mosques in Christchurch, New Zealand last Friday left at least 50 victims dead. In a win against the Charlotte Hornets on Tuesday night, Simmons wore a pair of shoes with the words "Egg Boy" on them and was the leading scorer of the game with 28 points. Last week, Simmons, who was born in Australia, had the words "Pray for NZ" written on his shoes in a game against the Sacramento Kings. The 22-year-old NBA star has made political comments before, calling Trump an "idiot" in 2017.